NEXT is launching our Spring education series on how we can impact climate change and equity by addressing local issues. Join us at Carolina Square’s new CURRENT Studio (123 W. Franklin Street in Chapel Hill) for one or more of these free community conversations. Everyone is welcome! Scroll to the bottom of this page for tips on commuting to Carolina Square. Please RSVP for each event you plan to attend. Scroll below for additional details. 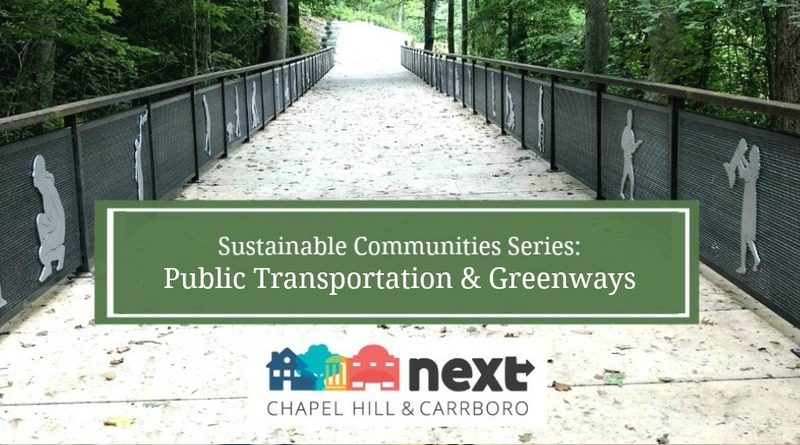 Join us for a walking conversation about the successes and opportunities to develop dense, walkable/bikeable, affordable downtowns in Chapel Hill and Carrboro. Starting at 6 pm in the Courtyard of the CURRENT Studio, 123 W. Franklin St., Ending at Steel String Brewery in Carrboro at 8 pm. Fantastic event – thanks to all who walked and learned with us! Comprehensive, regional public transportation systems and connected, accessible greenways are two strategies that can address the joint goals of ameliorating climate change and building equity. 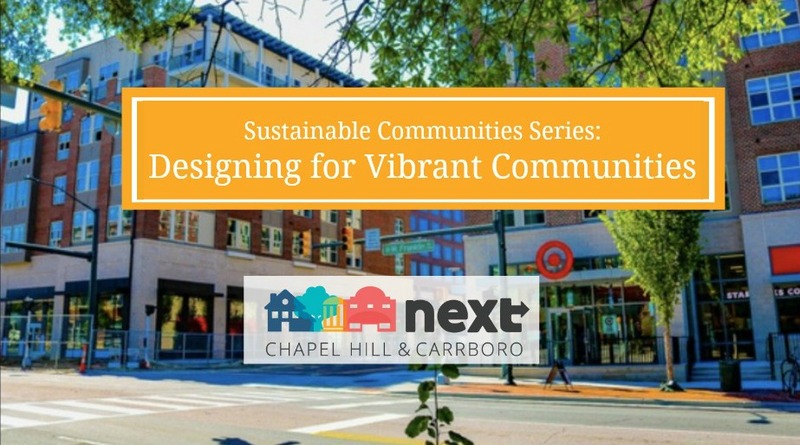 Join us in Carolina Square’s new CURRENT Studio (123 W. Franklin Street) for this important community conversation in our Sustainable Communities Series. Diverse and affordable housing is an important part of a sustainable community. 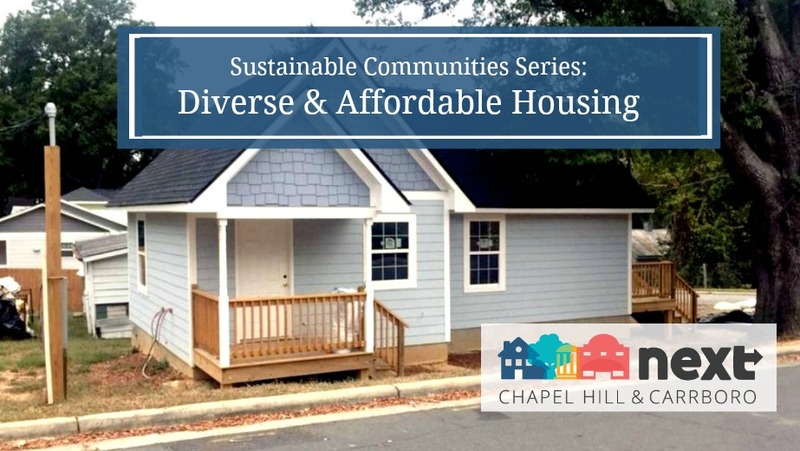 Join us in Carolina Square’s new CURRENT Studio (123 W. Franklin Street) to learn about the wide range of options we have for creating affordable housing, from low-income tax credits to tiny home initiatives, and which currently exist in Carrboro and Chapel Hill. Participants will engage in an interactive simulation to better understand which types of affordable housing options fit the needs of various community members. Being intentional about how we build our communities can have positive impacts on building equity and acting on climate change. On March 21, NEXT Chapel Hill-Carrboro sponsored a Downtown Walking Tour in Chapel Hill and Carrboro, part of a dialogue about the successes and opportunities to develop dense, walkable/bikeable, affordable downtowns in Chapel Hill and Carrboro. Join us on June 6 to continue that discussion: reviewing current and recent local initiatives; and discussing how plans for more dense development can be designed to align with community character. This will be a workshop format, taking place in Carolina Square’s new CURRENT Studio (123 W. Franklin Street). Three presentations will be offered, followed by a moderated question and discussion period, followed by more detailed discussion in breakout groups. Summary of approaches to design and density currently in practice in communities across the Triangle. Description of innovative approaches to incorporate affordable housing options into new development projects. Exploration of ways that projects of higher densities can be designed to align with and enhance community character. Speakers will be announced soon. Join this important finale to our Sustainable Communities Series on June 6! The Current Studio is easily accessible by foot, bike and public transportation: Chapel Hill Transit, GoTriangle and Orange Public Transportation, and Chapel Hill Transit. At Carolina Square, there are both in-door/covered and exterior bike racks. There are also electric charging stations for electric vehicles at the entrance of the parking deck.